It was a dizzying night on Friday night in downtown Buffalo. And that doesn’t include what was no doubt a wintry ride to the rink for the 9,000 or so that drove through a snow squall to see the Sabres play the Carolina Hurricanes. For one of the few times this season, those fans often had something to cheer about. The Sabres played an entertaining game, led by their young star. 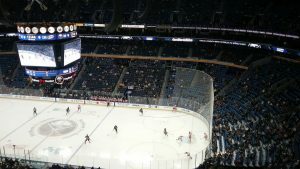 Yet the ending came out all wrong from their perspective, as the Hurricanes captured a 5-4 overtime win in the KeyBank Center. “Definitely it stings,” Buffalo’s Jack Eichel said. The first half of the game resembled what we’ve seen so many times before this season. Neither team scored in the first 30 minutes, and there weren’t a great many offensive chances. And then a hockey game broke out – a thrilling one, no less. The teams each scored a goal in the middle of the second period. Then in the third, it was back and forth action. Jake McCabe put Buffalo ahead, but the Hurricanes responded with three straight goals. Carolina’s 4-2 lead might have given a few fans thoughts of leaving early to brush their car off. But then Eichel just took over. He scored two goals in 10 seconds to complete his first NHL hat trick, and it was suddenly 4-4. 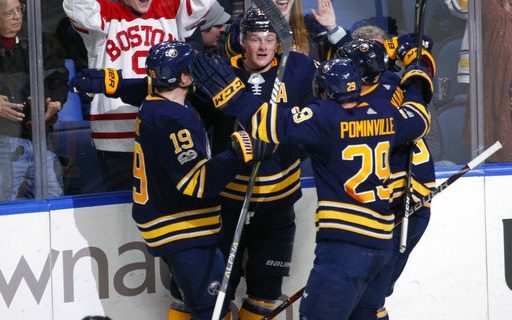 “I don’t think you talk about it,” Eichel said about the anticipation of getting a three-goal game. “You just try to help the team win. That makes you successful. The hat trick was Buffalo’s first at home since Thomas Vanek did it in 2011. Eichel finished with three goals and an assist, and wound up with 11 shots. The young center frequently hasn’t looked like someone who can play with the league’s best. On Friday, he was that and then some. “Jack took matters into his own hands,” coach Phil Housley said. What’s more, the fans stopped sitting on their hands and started using their throats to encourage the team. The wave even broke out of the third period. It was simply fun to be in the arena. “The building was into it,” Eichel said. But then the game went into overtime, which has been torture for the Sabres this season. Evander Kane missed on a breakaway, just failing to get a good shot off. A short time later, Jaccob Slavin came down the middle from his defensive position. His shot beat Chad Johnson for the winner – and the Sabres fell to 1-6 in overtime. Yes, the Sabres have points in five of their last six games – but have only won two of them. They only have three wins in their last 18 games. On a night when a Sabre crowd came so close to seeing a memorable win, it was just another disappointing finish.